As a new year approaches, let’s step back from the fog of negativity and division and instead highlight our community’s spirit of collectiveness and bringing people together that has led to key achievements improving models of arthritis care in Canada and around the world. In British Columbia, Arthritis Consumer Experts (ACE) partnered with BC’s leading arthritis specialists, researchers and patient organizations to launch the ArthritisBC+Me portal, designed to help BC patients fast-track their way to local arthritis information sources and programs of interest to them and best suited to their needs. The first of its kind in Canada, the portal represents the commitment of the community partners – ACE, Arthritis Research Canada, BC Society of Rheumatologists, Mary Pack Arthritis Program and The Arthritis Society, BC and Yukon – to make arthritis information and services more accessible to the estimated 1 in 5 British Columbians who are living with arthritis. Access to information and education plays a vitally important role in the earliest part of a person’s arthritis journey and throughout their life time. The portal helps the public and patients in BC search and find credible resources on prevention strategies, timely diagnosis, and treatment and self-care approaches. In partnership, the AAC, CFPC and CEP worked with health care providers—physicians, physiotherapists, and pharmacists, in conjunction with world-renowned Canadian OA experts and in consultation with informed OA patients—to develop a seven-page, easy-to-navigate tool that will help front line health care providers to identify symptoms and provide evidence-based, goal-oriented, non-pharmacological and pharmacological management while identifying triggers for investigations or referrals. Healthcare providers will have a standardized approach to identify symptoms and recommend therapies to help relieve pain and improve physical functioning, while also providing patients with high quality education to support their active role in self-care. A need to improve effective self-care practices. As lead author of the survey abstract, I presented the findings of the survey at the 2017 American College of Rheumatology Annual Scientific Meeting, where I explained to attendees how the survey advanced collaboration between the RA patient organizations around the world and highlighted the need to develop patient led strategies to address these and other uncovered gaps. Regionally, nationally, and globally, ACE did these things together as a community. So many of you made change possible and thanks to that collective effort, we have made great progress to help the more than 5 million Canadians living with rheumatoid arthritis, psoriatic arthritis, ankylosing spondylitis, osteoarthritis and the many other forms of the disease. Together, we have improved the lives of sick children, patients and plan members who had trouble with reimbursement for medications, employees who have been able to return to their job, parents who have been able to care for their family again, and seniors who have become active again. But our work continues into 2018: To advocate on behalf of osteoarthritis and inflammatory arthritis patients across Canada who still have unmet care and treatment needs. Whether it’s supporting patients to work in partnership with their healthcare professional, public formulary or private insurer, helping people reach out to their local elected official, or empowering them to maintain their work careers, ACE is committed to supporting Canadians by helping them take control of their disease and improve their quality of life. Through ACE’s JointHealth™ family of programs and the Arthritis Broadcast Network, we reach more than 150,000 Canadians each month. We’ve created or helped to create and run four web sites, three mobile phone applications, five Facebook pages, and four Twitter feeds, all to reach and help you. We are “by, for and with” people with arthritis. But we’re not satisfied. We want to further amplify the arthritis patient voice and make it easier for Canadians with arthritis to connect, interact and engage with each other, health care providers and policy makers. We can only achieve that through collective action and collaboration between our community partners. That’s what Canadians living with arthritis want to see: Our collective leadership and willingness to make a difference. To continue the incredible work, researchers, clinicians and patients have done on improving models of osteoarthritis and inflammatory arthritis care. To visit with policy makers in federal, provincial and territory governments and at the offices of private health insurers. To speak out and let the country know, in very real terms, the impact of arthritis, the growing burden over the next 30 years, the urgent need for action and intervention, and what it means for patients, families, employers, and health systems. In closing, I want to highlight one other activity, one that lives in the hearts of patient leaders across Canada. Our community comes together each year to recognize one person’s contributions to helping Canadians living with the disease and be heard in decision-making processes that affect millions. The Qualman-Davies Arthritis Consumer Community Leadership Award was created in 2014 in honour of Ann Qualman and Jim Davies who were early pioneers in arthritis advocacy in Canada. The 2017 recipient was Ms. Louise Bergeron, who passed away this past summer. At the Arthritis Alliance of Canada Annual Meeting in October, the award was presented to Louise’s son, Corey, and represented one of the most powerful moments of collectivity I have experienced. So, to Louise, a leader, mentor and friend, we say thank you for helping us. We will continue to advance your work and the thousands of others who volunteer for arthritis in Canada in the ways that we can. 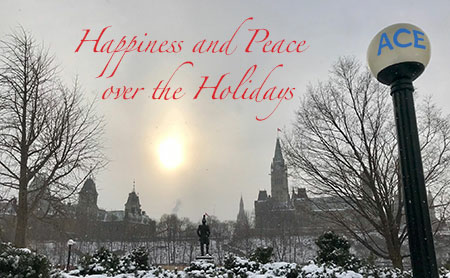 On behalf of my ACE colleagues, I wish you the happiest, healthiest holidays possible and the best for 2018!